What does Venezuela's election mean for upstream oil & gas sector risk? On 15 October, Venezuela's National Electoral Council announced that the ruling United Socialist Party of Venezuela (Partido Socialista Unido de Venezuela: PSUV) had won 17 of the country's 23 governorships in regional elections. The results were striking, as independent polls consistently show roughly 80% of the general public opposed to the current government. Venezuela's political opposition, the Organization of American States, and foreign governments - including those of the United States and France - have rejected the elections as neither free nor transparent. The Maduro government's latest electoral machinations build on its August 2017 decision to completely bypass the opposition-controlled National Assembly by establishing a National Constituent Assembly (ANC) comprised entirely of PSUV loyalists. The advent of the ANC triggered widespread international condemnation and set off a wave of incremental sanctions initiated by the US government. Additional US-led sanctions are now likely and threaten to nudge Venezuela further along a scenario that appears to lead inevitably to 'failed state' status. Venezuela's deepening institutional collapse will severely impede economic recovery through the next five years. Given the Maduro government's embrace of authoritarianism, IHS Markit no longer anticipates free and fair elections that would facilitate a transfer of power to the political opposition. Infighting among the respective opposition and Chavista camps will yield continued political dysfunction that will preclude implementation of a coherent economic reform program. This forecast puts Venezuela in sharp contrast to most other Latin American countries, which will enjoy an anticipated continuation of economic recovery over the five-year outlook. The political desperation of Venezuela's ruling elite will necessitate efforts aimed at generating upstream investment, new source hydrocarbon production volumes, and associated taxes and royalties to provide a critical financial lifeline to the Maduro administration. Pragmatic factions of Chavismo at the helms of PDVSA and the oil ministry will continue to push for select farm downs of PDVSA's upstream assets and the signing of new E&P joint ventures. Despite an eagerness among the more pragmatic factions of Chavismo to expand upstream access to foreign investors, resistance to this approach from the movement's influential nationalist factions will constrain the extent to which the Chavista authorities are ultimately able to close Venezuela's growing upstream competitiveness gap with other countries in the region. Structural risks related to non-payment, corruption, contract sanctity, facility and personnel violence, and labor unrest will persist through the outlook regardless of which political faction leads the country, constraining new investment and thereby holding economic recovery well below potential. The diagram below illustrates the effects of some of these forces. 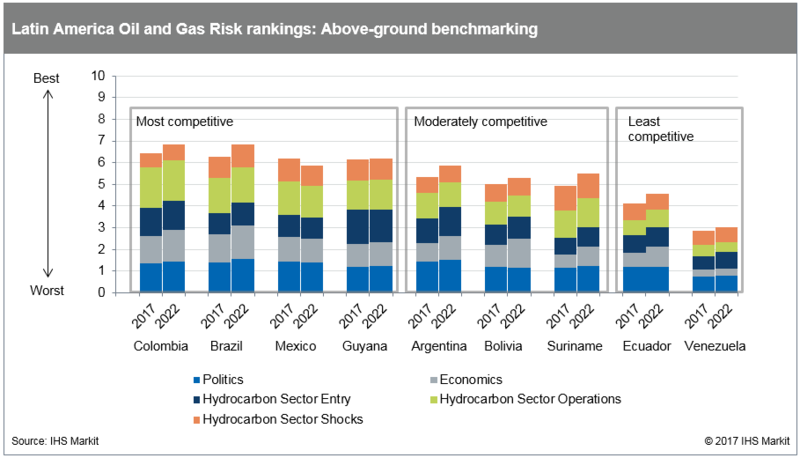 IHS Markit Oil and Gas Risk rankings reflect the forecast divergence between Venezuela and other Latin American countries. Shown in the chart below are eight Latin American hydrocarbon producers and one non-producer (Guyana), selected based on current investor interest in these countries' upstream sectors. We assess Brazil, Colombia, Guyana, and Mexico to be among the most competitive countries in Latin America for above-ground E&P attractiveness. Argentina, Bolivia, and Suriname are moderately competitive. Ecuador and Venezuela are in the least competitive tier. Overall scores in eight of the nine countries are forecast to increase by the end of the five-year outlook, signalling improvement. Mexico's overall score is forecast to decline modestly due to politically driven risks that threaten to muddle the economic outlook and erode the country's E&P competitiveness. Although Venezuela's overall score will improve over the next five years, the relative lack of economic recovery will constrain the extent of the total score increase. Consequently, Venezuela will not only remain in last place in the ranking but will actually fall even further behind most Latin American countries by 2022. Learn more about our coverage of E&P activity and results, upstream investment terms and petroleum sector risk worldwide. Ford Tanner is Principal Analyst, Petroleum Economics and Policy Solutions at IHS Markit.